It is cheap but it is very good to make well. Durability is verification from now on while using. This review is about item#40144684. If you sell in two sets (L only) anyway, the left and right products were good. This review is about item#40144693. I felt a sense of convenience at a reasonable price, so I would like to purchase again. Useful as a replacement mirror. With genuine like, I think that it is quite good for both COSPA and quality. Because it is written as 1 set, I did not mistake the right and left set, I purchased 2 sets wrongly. I want you to exchange! Since it is a product equivalent to a genuine product of Cub / Pro, there is almost no discomfort after installation. However, because the shaft is 8 mm, to convert the car body, you need a mirror adapter 8 mm → body side 10 mm conversion adapter. Especially on the left side is positive screw → reverse screw, so be careful. Quality from the viewpoint of price. It is even better if it is a right and left set. When exchanging, it changes to one side at once, so if it is a 2 pair, right and left set. As expected, I think how to sell one side in two. I think that one or left and right set is preferable. I think that it is good for the price in terms of quality but it is a little short compared to genuine. It is inexpensive and very helpful. We are also satisfied with prompt response. I bought two incorrectly by mistake. I think that the quality is pretty good, but I am satisfied because the price is cheap. The paint was extremely thin so it was bald up as soon as possible. However, I was satisfied with COSPA. There is no rattling of the angle adjustment part, it will be perfect if it lasts long. It is a solid thing. Since the direction of the mirror is changed as soon as the thing which is currently grazing, it replaced. Since the left was good, I ordered the right from afterwards. I would like to sell the set on the left and right. You do not need two left and two right. Thank you for your consideration. I thought that the two sets were left and right, and two sets for left and right were. I was mistaken. The two sets on the left and right are more convenient .... We ordered an additional order. It is solid in terms of product. 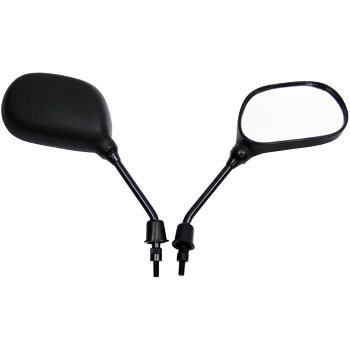 The width is narrower by about 2 cm than normal but the stay is a bit short but the curvature of the mirror looks tight and the view does not change very much and there is no problem in use. The cover of the stay attached to normal was also attached. As other people say it is a set of two on one side so make no mistake. The price is cheap, but it is a good product. It's incomplete when exactly one unit is exchanged, as it is not a set of right and left but a set of two on each side. I used it for Honda's Super Cub c 100. It is perfect. Goods are very good, COSPA is considered high. If you handle the left and right sets, the number of purchases will definitely increase. I am satisfied with reasonable price.